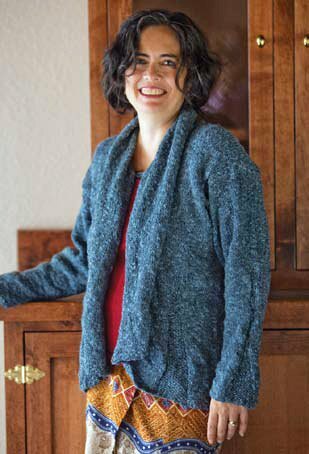 A note from Kathleen: Anna-Liza Armfield, Customer Service Representative and knitter extraordinaire at Interweave is here to tell you about her first experience designing a sweater—the free pattern, Casual Flair Cardigan. She did such a wonderful job on it. Here she is to talk about her process. In February of 2009, a call for staff projects went out to all Interweave employees for a brand new Interweave Knits title, Weekends. I had been mulling over a cardigan in my head and decided to accept the challenge, in spite of the fact that I had never done a "start to finish" design before, and had never created a design with the intention that anyone else would be trying to follow my instructions. I submitted a sketch and a general description of what I had in mind. Coming up with the yardage estimate made me very nervous. I searched through books, magazines, and online to get a general idea about yardage for similar styles of sweater, but didn't find many. I took a generous average of the closest I could find and then added more because of the wide, drapey collar I had in mind. The deadline was pretty tight for knitting an entire adult-sized sweater, especially considering I'm a promiscuous knitter—I never have fewer than three projects on the needles, and usually more. I spent quite a few hours at my favorite café, with the owner bringing me a constant stream of mochas while I pored over sketches, graph paper, and calculator. I knitted away furiously, abandoning all other projects. Several times, I realized what I had designed either wasn't suited to the yarn or just flat wouldn't work, and had to rip back and redesign. That happened more than once with the godets at the bottom edge. However, there was a bonus—I've gotten pretty good at dropping back a section of knitting without ripping back all the way across, then reknitting it correctly row by row. Toward the end, one of my knitting buddies knit the wide collar for me and my husband, darling that he is, offered to try doing the seaming while I knit the sleeves. (He managed a few inches before he confessed he was afraid to go any further for fear of ruining the sweater). At last it was done, even if I would have liked to fiddle with it even more than I already had. I turned it over to our editorial staff, wondering if it was really any good or not. Living with a design and a sweater day and night will tend to make you see all of the flaws, and completely lose sight of the good things. The response was gratifying! Several people told me it was good, including Eunny (for whom I still have to stifle a fangirl shriek whenever I see her, poor woman). Eunny was also present at the photo shoot (did I mention they wanted us to model our own projects?) and was very encouraging. They even got a decent photo or two of me! I have to confess, I jumped up from the computer and did a little happy dance, squealing and jumping up and down and flapping my hands. Most dignified, I assure you. I think even my cat laughed at me. If you have a yen to dip your toe in the design pond, or even dive right in, there's lots of help! Ravelry has a "Budding Designers" group that has answers to lots of questions. Interweave has the Harmony Guides stitch dictionaries and Ann Budd's wonderful Knitter's Guides. And you can check the submission guidelines for pretty much any print or online magazine on their websites—even Interweave Knits has its guidelines online. It's been over a year and a half since I took the plunge. I've had a couple more designs published and I can say the thrill isn't any less. Design requires some creativity, some willingness to make mistakes (and fix them), and a good dose of discipline to see it through, but it's probably not as hard as you think it is! The world needs more fun, creativity, and beauty. Why not see if this is a way you can add your bit?